The 24 button speakerphone is the premier telephone for maximum Call Management effectiveness. It enables you, the owner-manager or president of a company, to monitor phone activity at a glance. This is especially important for companies that are growing. The 7 Button speakerphone is reduced in size, not power. It's frequently the most practical solution for companies that don't need sophisticated optional features, but do need to meet the straightforward high volume traffic usually associated with retail or industrial applications. Samsung's unique Add-On Module provides 32 additional programmable buttons. Add up to two AOM's, for a total of 64 programmable buttons, to any keyset in the DCS family line. 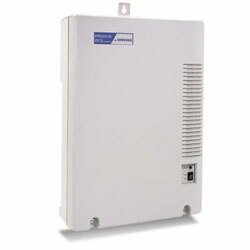 Use the AOM as a stand-alone intercom unit, room monitor or for our executive OHVA feature. The DCS Compact uses Computer Telephony Integration (CTI) to easily interface with your personal computer. CTI multiples your communications power a hundred times over. The computer telephony module can be added to any station at any time. * Requires optional hardware and/or software. **Not available on 7 button model. ** Not available on 7 button model.